A few years ago I stayed at the Ace Hotel in Palm Springs. It’s a mid-century motel in the middle of the desert that has been updated to a trendy retro hotel full of hipsters lolling by the pool sipping pink cocktails. It’s super cool. Ever since, I’ve fantasised about buying a motel in a small Victorian country town, doing it up lovingly and running a weekend getaway for all the Melbourne hipsters to visit. When Ford offered me the opportunity to drive the Ford Kuga Titanium for awhile and blog about it, I decided to live out a little bit of my motel dream, because the thing about motels is that they’re of the era of the classic road trip. Having a pair of hot wheels to hit the open road with is essential. With the Kuga’s giant sun roof open, the Ford navigation lady telling me where to go, tunes playing using SYNC voice control (talking to my car and it listening is really quite cool) and luggage stowed in the roomy storage spaces, I sought out the perfect motel. The best kind of motels are well preserved relics of the 60s and 70s, complete with drive-through check in, a car park directly outside your room, painted brick walls, avocado-coloured bathroom suites and the essential hole-in-the-wall breakfast door. The latter was my inspiration. I can’t buy a motel, but I can create an awesome, updated retro motel breakfast. This week we came home to find our pantry in disarray. Jars were smashed, sugar and barley and pasta and other hard-to-clean-up things were strewn across the floor, appliances were knocked over and a shelf that had been holding my cookbooks was no longer on the wall. I had overloaded that shelf with far too many books, and it crumbled under the weight. It was not the shelf’s fault. It had done a valiant job of holding the books up for almost three months, but it could take the strain no more, and politely waited until we were safely out of the house to collapse, sending all the books tumbling to the ground. The pantry has been tidied, but the books need a new home. While I was stacking them in a temporary corner, I picked out my favourites to sit at the top, and thought I’d share them with you. I’ve created a page with my go-to cookbooks listed. If you like the recipes I post on Simple Provisions, then you may be interested to see my favourite books, as they are what influence my cooking. It’s picnic season! The frosts of winter have melted, leaving the daffodils to bloom and the trees to blossom, beckoning us outdoors to reacquaint ourselves with the sun. I’ve received extra incentive to get out and about this year as I’ve been loaned a new Ford Kuga Titanium as part of the Kidspot Voices of 2014 competition (I’m a finalist in the Food and Wellbeing category!). I get the car for six weeks, and I’ll be featuring it in three blog posts over the coming weeks. The challenge has inspired me to get out of the house and celebrate Central Victoria, starting with picnics. Friends often ask me for my Kyneton tips, and I think a road trip that involves a picnic of local produce, a walk in nature and possibly a swim in a natural watering hole is the perfect thing. Kyneton is a bit over an hour from Melbourne, and makes an excellent day trip. So here’s The Simple Provisions Guide to Kyneton Picnics, complete with where to stock up on picnic provisions, and three of my favourite picnic spots. 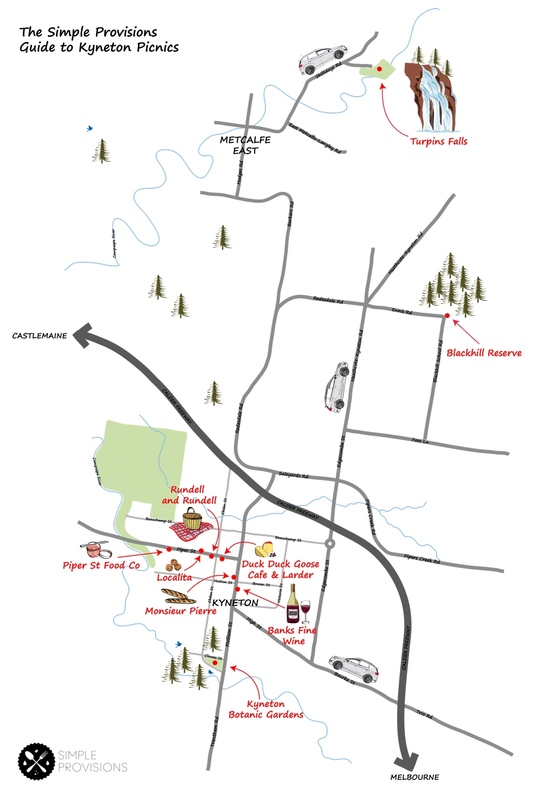 Click on the map to see it full size and print it out for your day trip. I’ve collaborated with local artist Lucy King to come up with this lovely map for you to print out for your day trip, and her gorgeous illustrations will also feature in the other challenge posts in the coming weeks, further celebrating local talent. I have a picnic box in the shed. It’s a box of rugs, baskets, utensils, cups, plates, games, hats and all the things that make picnics fun. Having all the bits in one place means it’s easy to pack for a spur of the moment picnic, which are the best kind. My fancy loan car made it even easier as it has keyless entry (so handy with the babe in arms, I need this feature in my life permanently) and a magic tailgate that opens with a wave of my foot under the bumper bar. Seriously. Here’s a list of all the places in Kyneton to shop for your picnic provisions, so you can fill those baskets in the boot with gorgeous local produce. My friends and I started a tradition nearly ten years ago of the “Scone Off”. I don’t think I was even involved in the original heated discussion over whether lemonade scones were better than traditional scones, but somehow I got drawn in to a competition of who could cook the best scones. The inaugural Scone Off was inappropriately held in the middle of Summer, on the hottest day of the year, in a small apartment with a tiny galley kitchen that more resembled a sauna by the end of the afternoon. Three contestants cooked three scones each; plain, savoury and sweet. The judges, our partners and one impartial ring-in, took their tasting very seriously. Scorecards were produced with judging categories including taste, texture, appearance and presentation. That year the Presbyterian Women’s Missionary Union cookbook provided the guidance for the winning scone. It didn’t rise as well as the lemonade scone, but it was light, golden and tasted just like a nanna would make, so it took out the prize. I came second that year, let down by a batch of burnt bottoms. I have lifestyle envy of Ann Mah. She is a food and travel writer and published author who divides her time between Paris and New York with her diplomat husband and delightful baby. She’s lived all over the world and written about her food experiences in China, Italy, and most extensively, France. Last year her memoir of eating her way around France was published, and I enjoyed reading it in the final weeks of my pregnancy when I was doing a lot of eating but not a lot of travelling. Ann’s fridge is similar to mine right now, full of half-eaten bits of baby food, but she also has a genius trick for keeping ginger fresh that I’m totally stealing. Read on to take a peek inside an international food writer’s fridge. Did You See the Radishes? Due to a technical glitch, the email announcing this week’s post did not go out. Which means you may have missed a bright pink jar of pickles! If your burgers, tacos or sandwiches need a little pick-me-up, take a look at this recipe for Quick Pickled Radishes. If radishes were in a beauty pageant, they’d nail the looks category. They’re truly beautiful vegetables with their vibrant, hot pink skin, china-doll white flesh and ruffly green leaves. But when it comes to the talent portion of the evening, the judges may shift uncomfortably in their seats as Miss Radish struggles to prove her versatility. Radishes are most commonly eaten raw. The French love them with a thick spread of expensive unsalted butter and a touch of sea salt, making them the easiest, prettiest hors d’oeuvre ever. Radishes can add a mustardy crunch to salads and will look stunning sliced thinly on top of a fish taco. But unless you’re making a lot of fish tacos, you’re unlikely to use a whole bunch of radishes in one sitting. And then you’re left with at least a few pink spheres rolling around in your vegetable drawer, destined to lose their crunch. My oven and I are getting to know each other. We’re in the early stages of a potentially long-term relationship, and, to be honest, it’s not going so well. I tried to ignore the fact that this new oven is a third of the size of my old one. Size isn’t everything, right? And its cooktop is electric. Julia Child had an electric stove! But this oven runs hot and fast, and it shoots cold air out of a vent that is at the exact height of my bum when I’m preparing food at the bench opposite it. I mean, that’s just rude! Braving a cold rear, I wanted to share a dessert with the oven. A light, fluffy dessert that would really test this fledging relationship.